I am always glad for a new book that promotes the good history of fundamentalism. Oats’ (long time professor at Maranatha Baptist University) proposition is that fundamentalism’s history is a history of separation, and that the history of separation is intrinsically related to the doctrine of the church. Though this history is primarily of the 20th century, Oats rehearses the history of separatist groups through the centuries and then applies that to the 20th. He writes, “The fundamentalists did not make separation their primary function; separation for them was a result of their desire to maintain obedience to the Word of God and the purity of the church. 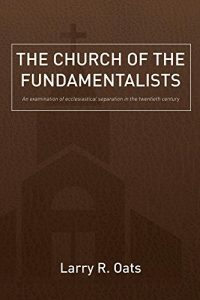 It was not the fundamentalists alone who saw a distinctive ecclesiology to be at the heart of the division between fundamentalism and the new evangelicalism” (p. 112). Later he adds, “Both movements agreed, for the most part, that there was a spiritual universal or invisible church which was composed only of believers, while the local church was composed of a mix of saved and lost. The evangelicals were willing to live with this mixture, while fundamentalism sought to purify both local churches and denominations or leave them because of their failure to obey Scripture. The evangelicals were more willing than the fundamentalists to tolerate unbelief in their churches and denominations” (p. 164). Oats explains that the evangelicals put so much emphasis on the universal church which is always pure in God’s eyes, that they didn’t need to worry about sin in the local assemblies. But fundamentalists saw the local church as the pillar and ground of the truth and the only earthly witness to the body of Christ. Therefore it was necessary to practice purity, or separation, where it can be seen. This history is often complicated and full of twists and turns over 100 years and that is why I enjoy another writing of it. One drawback that some (of us) may see is that he uses Bob Jones senior and junior, and John R. Rice as his primary representatives of fundamentalism, especially in the periods of 1926-1940, and also of 1940-1980. He mentions others (including the GARBC) but leaves out totally Central Seminary and the BBFI. He gives a good history of Carl McIntire and J. Gresham Machen and the Presbyterian split. He also gives good information about the history of the NAE, Billy Graham, and major evangelical figures. However, every author has to narrow the focus when writing on the whole century. He acknowledges that those histories are well represented in other good histories. For example, he mentions Bauder and Delnay and their history of the NBC and GARBC (p. 14). This is a good book and adds good information to the on-going knowledge of fundamentalism.